"...to help the organization understand the global mobile telephony landscape as it relates to advancing development, and as an area of significant future opportunities. Evidence for the report comes from UNICEF operational staff and representatives of mobile operators in 14 countries (Bangladesh, Egypt, Ghana, Iraq, Kosovo, Lao PDR, Malawi, Mongolia, Philippines, Sierra Leone, Sri Lanka, Suriname, Uganda, and Zambia). 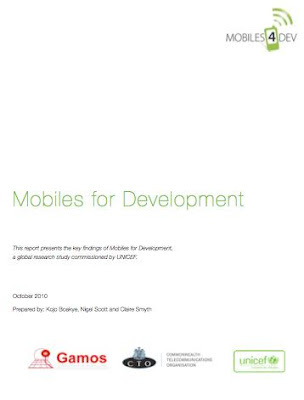 The report suggests that mobile tools can identify the most deprived children and communities, provide cost effective interventions, overcome bottlenecks to services, and enable communities to maximize the impact of available resources."